Who says it doesn’t pay to drink? 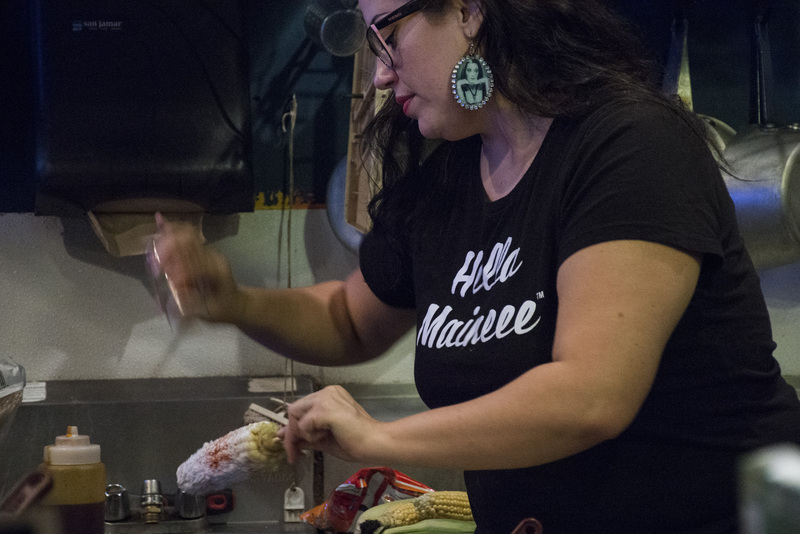 La Cubana and Elotes, a pop-up food event featuring both foods, is a culinary match made not in heaven but on the street – in a mixture of drink, bad luck and an an act of kindness. “Chale” Martinez was on her way home from a concert when she decided to stop in at Clooney’s, a bar on 25th and Valencia streets. She says she was fairly drunk as she headed up and ran into a woman who told her she was in dire straits. The woman, Antoinette Streczyn-Batista, had been pickpocketed and earlier in the evening she had also lost a cooking partner for her pop-up food event at local bars. She feared she wouldn’t be able to make rent. The next day, she called up Streczyn-Batista – to check in. “Are we still doing this?” she asked. They were. Streczyn-Batista had been cooking at Bender’s, a bar on 19th and South Van Ness Avenue, for a while, and Martinez was about to come onboard as a helping hand in the kitchen. It worked. It turns out the unlikely duo has a shared interest in bolstering the local economy, creating a network of mutual support among businesses by purchasing all of their ingredients from neighborhood vendors. By now, the pair is a familiar sight to grocery owners up and down 24th street and on Mission, who already know what they need. “It’s very important that we all support each other right now, if we can start our own little ecosystem and help each other rise up… we can create something really good and positive,” Martinez said. That’s not where the local support ends. Whenever there are leftovers, they are distributed to the homeless or others going hungry (Martinez notes that one doesn’t necessarily have to be homeless to be in need). At a recent pop-up, the pair set up peanut butter and jelly sandwich making stations so anyone who was so inclined could pack some to go and hand out to whoever needed them. There’s even a delivery service now – Martinez noted that some who might love the food and the concept might have young children or have other reasons for not wanting to spend Sunday afternoon in a bar. For those who have the means and like the atmosphere, however, La Cubana and Elote are an increasingly popular destination. 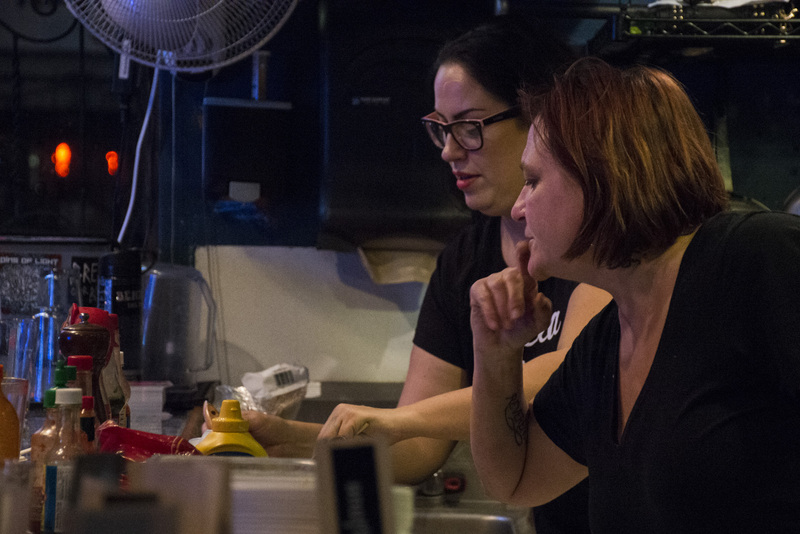 Niki Baicardi and Lydia Lenzen sat at the bar in front of a large plate of nachos on a recent Sunday afternoon, exhausted at the end of an evening in which they had consumed fried plantains, Cuban sandwiches and now nachos. “We found it on Facebook,” Baicardi said, adding that they were happy to have made their way over to Bender’s for the feast. 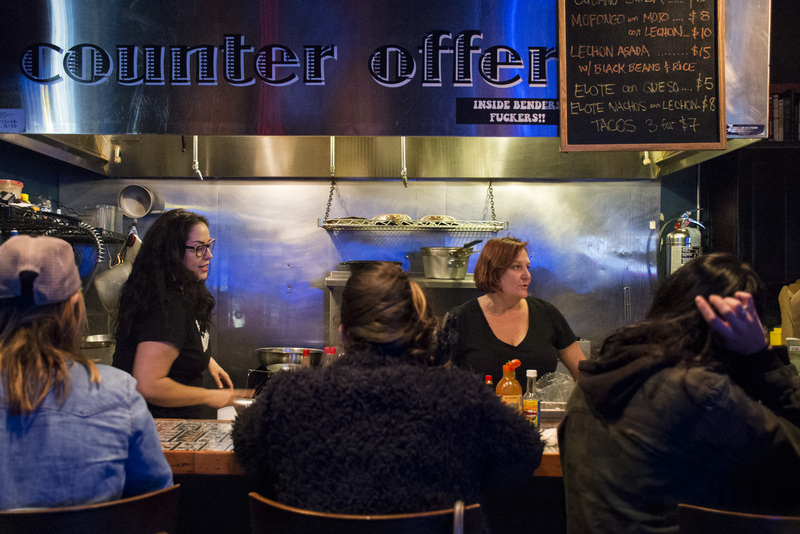 Martinez and Stretcyn-Batista ran around taking phone orders and filling orders from customers lined up at the counter at the cash-only pop-up at Benders on Sunday night. Lance Reichert and Marvin Carlisle just happened to drop in at the bar and both were finishing off Cuban sandwiches and beer. “It’s delicious,” said Reichert holding up the pork sandwich. The women have already started to – cautiously – dream big. Her business partner is a little more effusive. For now, they plan to run the pop-up at least once a month at bars including Bender’s and Clooney’s. Lydia Chávez contributed to this story. The earrings Chale is wearing are also from another local artist Lorena DelaRosa. Props to both of you!! We’ve tried La Cubana and Elotes at Benders a few times and loved it. I was wondering if you could include what days they are at Benders and Clooneys? Do you have a link with more info on the restaurant? Thanks.